In Windows it's all UI. Most people just double click on the icons or shortcuts to run the programs. Click on the cross icon to close it. Though it makes life easier as a programmer we should also know how to do the same using command line. Specially if you are wiring a program to do such a thing. In Linux/Unix it's quite easy. To start a process simply add it to the PATH and call the process. For example simply open the console and type 'firefox'. That should launch firefox for you. If you want to stop the process you can execute kill -9 processId. Lets see how can we do the same in Windows. Press Ctrl + R . This should open the "Run" prompt for you. In this prompt type "cmd" (without quotes) and hit enter. Or you can open it from start button . Search for cmd or command and you should see cmd.exe or command prompt. Both are same. Click on it. Search for cmd or command. 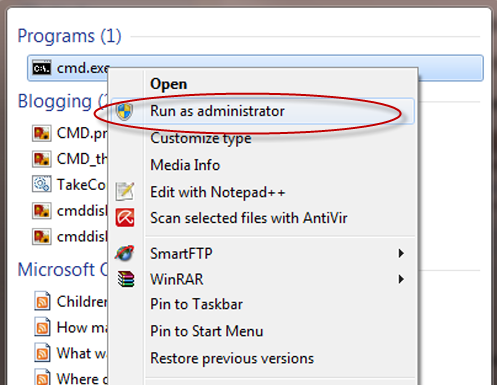 Right click on cmd.exe or command prompt and select Run as Administrator. One way to stop or terminate Windows process from command line is via the PID of the process. To get the PID use one of the way described in Getting PID of process section above. Important Note : /F option is taskkill denotes force kill. Your unsaved data might be lost! Note : You can do all the above using Task manager [Ctrl + Shift + Esc] too (UI based). Above method is just a way to do it via command line. It will be specially useful when writing program to execute process like runtime.getruntime().exec() in java.